Major General Hugh John “Pat” Casey will always be remembered as General Douglas MacArthur’s chief engineer because his greatest achievements as an engineer came during his eight years with MacArthur. From the desperate fighting on Bataan through the long months it took to drive the Japanese out of New Guinea and the Philippines to the occupation of Japan, Casey directed an impressive engineer effort that allowed MacArthur’s Allied ground, air, and sea forces to win the war and secure the peace. Casey started his career in the Army and Corps of Engineers as an underage plebe who entered the US Military Academy [USMA] during the summer of 1915. He was third in his class, which graduated in June 1918 due to the demands of World War I, and joined the Corps of Engineers. He completed the Engineer School in June 1920 and had the normal troop assignments and company commands in the United States and with the American Forces in Germany before serving a stint as an engineer ROTC instructor at the University of Kansas from 1922 to 1926. After completing the Company Officers Course at the Engineer School in June 1927, he received his initial civil works assignment with the Pittsburgh District. There he conducted one of the first major flood control surveys in the Corps of Engineers and later was responsible for construction at Deadman Island Lock and Dam (now called Dashields Lock and Dam) on the Ohio River. The knowledge he gained at Pittsburgh was extremely useful in his next assignment as the assistant to the officer-in-charge, Rivers and Harbors Section, Office of the Chief of Engineers. As assistant to Colonel John J. Kingman, whose position was equivalent to today’s director of civil works, Casey gained experience in dealing with Congress and the major leaders of the Corps on civil works. Not only was he involved in congressional matters; he also handled coordination with the districts and divisions, developed budgets and programs, and found time to design and patent a floating mooring bit for high-lift locks. Casey was always known in the Corps for his ingenuity, intelligence, and skill as an engineer.In 1933 he won a two-year John R. Freeman fellowship from the American Society of Mechanical Engineers (ASME) to study hydraulics and civil engineering in Germany.His stay in Germany coincided with Adolf Hitler’s consolidation of power, and he left there in 1935 with his Doctorate in Engineering and a foreboding of the European conflict that was to come. When he returned to the United States in June 1935, Casey had orders to proceed to Vicksburg, Mississippi, to take over the Waterways Experiment Station. At the Quartermaster Dock in Bayonne, New Jersey, Lucius D. Clay, Casey’s roommate for three years at West Point and close personal friend, gave him new orders—he was to be the chief of the Engineering Division at the Passamaquoddy Tidal Power Project headquartered at EastPort, Maine. This major New Deal public works project was soon terminated, but not before Casey made a significant, lasting contribution to the Corps’ research and development laboratories. At Eastport, he established a concrete testing laboratory under Charles E. Wuerpel to examine the effects of saltwater, of extreme tidal ranges and accompanying variations in water pressure, and of the severe freeze-thaw cycles on aggregates, cements, and concretes to be used in the construction. That pioneering concrete testing lab still exists as the Structures Laboratory at the Waterways Experiment Station at Vicksburg, Mississippi. Following the demise of the Passamaquoddy project, Casey served with the old Boston Engineer District on flood control surveys of the Connecticut River Valley before going to the Philippines in September 1937. His duty there was two-fold: He advised the Commonwealth Government on hydropower development and flood control and he served as engineer assistant to the military adviser, General Douglas MacArthur. To complete his first mission, Casey crisscrossed the Philippines to determine its potential for hydropower and its needs for flood control. For his pioneering endeavors in this area, President Ferdinand Marcos of the Philippines in 1972 bestowed on Casey the honorary title of “the father of water power development in the Philippines. ” The firsthand knowledge of the Philippine topography that Casey gained during his surveys allowed him during World War II to plan and act with a detailed personal knowledge of the terrain. His second duty, to advise MacArthur, brought Casey into close contact with his future commander and many of the Philippine Army engineers and units that worked under his direction in 1941-1942 and 1944-1945. Casey returned to Washington, DC, late in 1940 to become chief of the Design and Engineering Section, Construction Division, Office of the Quartermaster General, under Brigadier General Brehon B. Somervell, another engineer officer. His primary concern was rationalizing and standardizing the designs for projects to be built as part of the nation’s defense mobilization program. On the afternoon of Thursday, 17 July 1941, Somervell, who later commanded the Army Service Forces, gave Casey a new special project, the design of an office building to house the entire War Department. Over that weekend, Casey and his staff roughed out the design for a five-story, five-sided structure to accommodate 40,000 persons in what would be the largest office building in the world—now known as the Pentagon. In September 1941, Douglas MacArthur, recalled to active duty as Commanding General, US Army Forces, Far East, in the Philippines, asked Casey to return as his chief engineer. Arriving back in Manila in October, Casey had little time to repair the years of neglect caused by minuscule defense appropriations before the Japanese struck Pearl Harbor on 7 December 1941. Air attacks and landings on Luzon soon followed, and the outnumbered American and Filipino defenders were forced to withdraw to the rugged Bataan Peninsula. Casey’s abilities as a soldier and engineer were most clearly seen in the early years of the war against Japan. During the arduous defensive fighting against the Japanese invaders in the Philippines from December 1941 until his evacuation with MacArthur to Australia in March 1942, Casey used his skill, intelligence, and imagination to provide the ill-equipped American and Filipino troops with the equipment and time to stall the enemy’s advance. “Casey Cookies” became plentiful substitutes for precious hand grenades, while “Casey Coffins" made out of cigar boxes were used as antitank mines against Japanese vehicles. “Casey Dynamiters, ” mostly civilian mining engineers commissioned by Casey, destroyed bridges, supplies, and facilities in front of the advancing Japanese. Casey’s personal courage was as pronounced as his intelligence. He received the Distinguished Service Cross (DSC) in the Philippines and the Silver Star at Buna, New Guinea, in November 1942. Of all his wartime experiences, Casey’s actions on Bataan stand out as his greatest mark as a soldier. He was constantly on the go, inspecting the frontline positions, advising units on improving their defenses, shuttling to Corregidor to see MacArthur and his staff, and providing what engineer supplies he could find or manufacture to strengthen the American-Filipino hold on the peninsula. He was the only member of MacArthur’s staff who established his headquarters on Bataan and remained there rather than move to Malinta Tunnel on Corregidor. In fact, MacArthur personally had to order Casey to leave Bataan when President Franklin D. Roosevelt ordered MacArthur and his staff to Australia. Casey always regretted that he had left “his men” on Bataan and Corregidor and did not suffer their fate with them. He went on to Australia, and there played a key role in establishing the base from which the Allied forces could strike back at the Japanese. As the chief engineer, General Headquarters, Allied Forces, Southwest Pacific Area (GHQ, SWPA), Casey eventually controlled an engineer force of over 275,000 officers and men by the war’s end. He was fond of repeating MacArthur’s comment that the war in the Southwest Pacific was an “Engineers’ war. ” It was an engineers’ war because MacArthur’s successes depended so heavily upon the seizure and development of air and ground bases that allowed the next forward movement. The task facing the engineers was no easy one because little or nothing in the way of military installations existed in this primitive area to support the Allied forces. After the war, Casey remained with MacArthur as chief engineer of the U.S. Army Forces, Far East, and Far East Command. He was responsible for developing the American bases in Japan, Korea, and Okinawa that supported the Army and Air Force presence in the Far East. His work with MacArthur during the occupation of Japan contributed to that nation’s postwar recovery. In 1948, when the successor for the retiring Chief of Engineers, Lieutenant General Raymond Wheeler, was being selected, Casey was the leading candidate. He was the choice of Wheeler; General Omar Bradley, the Army Chief of Staff; and Kenneth Royall, Secretary of the Army. President Harry S Truman favored Lewis Pick, the Missouri River division engineer. Although Casey was appointed the Ohio River division engineer in 1949, he never served in that capacity and retired in December of that year. Casey went on to an active second career, serving in various posts with Schenley Industries from 1951 until his retirement in 1964. After years of chronic heart problems, he finally succumbed to a heart attack on 30 August 1981 while in the Veterans Administration Hospital at White River Junction, Vermont, recovering from a stroke suffered in July. He was buried at Arlington National Cemetery next to his son, Major Hugh Boyd Casey, who died in an air crash in Korea during the Korean War. In August 1982, Lieutenant General Joseph K. Bratton, the Chief of Engineers, and Mrs. Dorothy Casey, the general’s widow, dedicated a new building at the Humphreys Engineer Center at Fort Belvoir, Virginia, in honor of Major General Hugh John Casey. 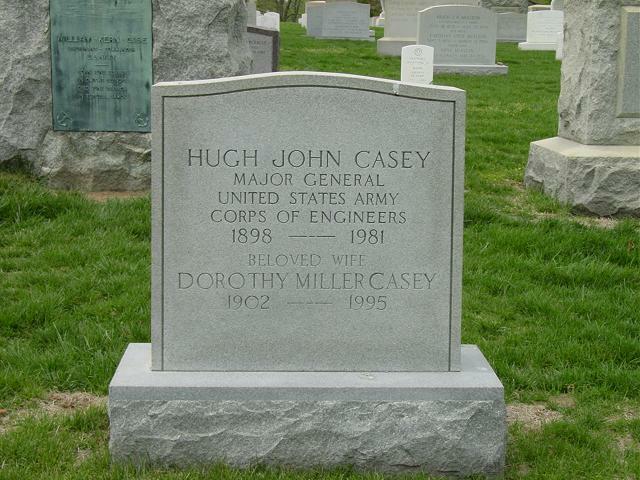 Hugh John Casey, Major General, United States Army, Corps of Engineers. 1898-1981. Section 3, Arlington National Cemetery. His son, Hugh Boyd Casey, Major, United States Army, was a veteran of World War II and was killed in an air crash in Korea during the war there. Father and son are buried adjacent to one another in Section 3.